Please reset your password. After doing so, you can log in with your new password. FilmCare.org is both a decision-making tool and a comprehensive learning resource for all types and formats of film. 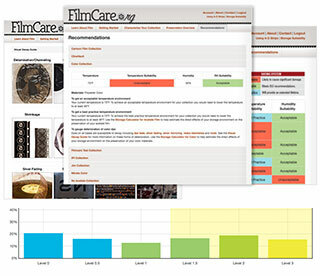 FilmCare.org is a central resource for best practices in film preservation that provides guidelines for dealing with the preservation of all types and formats of film materials. It addresses the requirements for preserving black-and-white and color film and nitrate, acetate, and polyester-based film. It also addresses specific issues for motion-picture film, sheet film, still roll film, microfilm, and aerial film, as well as the management of collections containing a variety of media types (certainly the most common real-life situations encountered in the field). This approach focuses primarily on storage, condition surveys, and the development and implementation of best-fit environment-based strategies. Thank you to National Endowment for the Humanities for funding this website and making the project possible. In addition, many individuals have contributed to the content and development of this site, including: Rachel Bauer, Jean-Louis Bigourdan, Alex Bliss, Gloria Diez, Ellie Groom, Shannon Fitzpatrick, Josh Haidet, James Layton, Jennifer Miko, Gordon Nelson, Doug Nishimura, Lauren Parish, James Reilly, Kristin Smith, Giorgio Trumpy, Andy Whitmore, Josh Yocum, and the Motion Picture Department at George Eastman Museum.